American fast-food so dominates the global marketplace, it obscures the fact that other nations are also quite skilled at guaranteeing no one ever has to tell their parents how their day went. 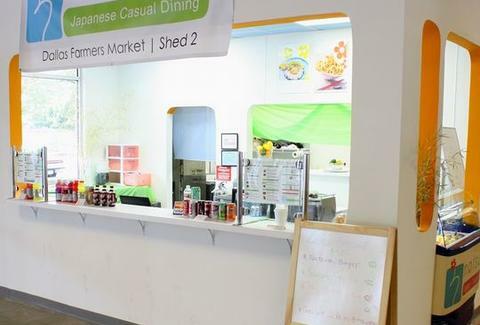 Bringing Japanese fast-food to Farmers Market's Shed 2, Natsumi Kitchen. NK's a partnership between the owner of Henderson's Natsumi and the sushi chef from now-closed Geisha House, Yoshi, who unlike Sting has a perfectly sane reason to dream of the blue turtles. 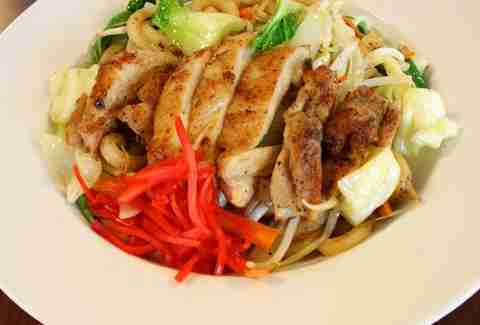 The menu's based on simple-to-prep dishes peddled on the Rising Sun's urban streets, with most ingredients sourced mere feet away; anchors run from the fried-rice Gyudon Beef Bowl, to beef/chicken/shrimp fried-egg noodle Tokyo Yakisoba, to the smashed potato croquette Shrimp Korokke sandwich (if you go with shrimp karaoke, "Raspberry Beret" is definitely the best Prince song). Appetizer-sized offerings include Beef Gyoza pan-fried dumplings, Karaage marinated fried chicken, and sushi rolls like the avocado-wrapped unagi/cucumber Caterpillar, light enough that after eating you should still be able to do the worm. NK also slings Natsumi's always-rotating soy-based gelato, in flavors from Belgian dark chocolate to tiramisu; unlike on Henderson, they'll also stuff the stuff into huge crepes along with liquid chocolate and whipped cream, the use of whose dizzying propellant is exactly why you don't want to tell Mom how your day went.